Forest bluegrass (Bothriochloa bladhii), or Burnett bluegrass as it is sometimes known, is one of our very productive native grasses. It is commonly found on the black soil along river and creek banks and on heavier black clay soils throughout southern Queensland. Forest bluegrass is also native to Africa, India and some Pacific Islands. Forest bluegrass will grow to one metre high. During the growing season the leaf has a distinct bluish hue with a red tinge in drier times. It is a bulky plant with stems 3 to 4mm thick. The nodes (joints) on the stem are slightly hairy. The seed head is large and dark red with small purplish seeds. Like most Bothriochloa species, fresh green plants of forest bluegrass are aromatic, particularly when crushed. This is one of our 3P grasses, being perennial, productive and palatable. Forest bluegrass is readily eaten by stock and on many properties it has been grazed out. A high proportion of this grass in a pasture indicates good grazing management. Like all good pasture species it benefits from being spelled over the growing season so that it can go to seed. Experimental work indicates that forest bluegrass increases production with increased CO2, so it appears to have some capability to cope with global warming. 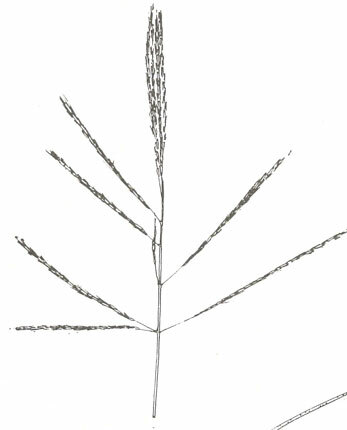 Like most of our native pasture species, seed is not often available. However seed of an introduced selection of Bothrichloa bladhi subsp. glabra cv. Swann is available. This leafy variety was selected on the infertile traprock soils of southern Queensland but it will grow on a wide range of soil types. As a sown pasture species Swann has moderate spring vigour and persists under heavy grazing. Swann produces a fluffy and small but high quality seed in late March, and can spread from seed and short rhizomes. It needs a good seed bed to establish well.